Jean Shinoda Bolen writes of the wise old woman archetype in her book, Goddesses in Older Women: Archetypes in Women over Fifty. "By knowing who the goddesses are, woman can become more conscious than they would otherwise be of the potentials within them that, once tapped, are sources of spirituality, wisdom, compassion, and action. When archetypes are activated, they energize us and give us a sense of meaning and authenticity." Bolen follows the tradition of other Jungian scholars in equating common female archetypes to the goddesses of Greek mythology. Her first book the Goddesses of Everywoman focused on the adult female. Here she discussed the goddess-mother Demeter and the woman-child Persephone. 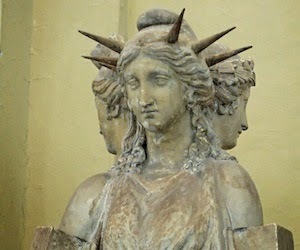 But where, alas, was Hecate, the crone goddess? She who stands at the cross-roads in the dark, her three faces looking toward the past, present and future? Hecate represents the last in the triad of women roles: maiden, mother and crone. (We see these roles represented in other mythos too, although the Greek/Roman stories are the most familiar examples.) This archetype is fully expressed in Bolen's second book in which she identifies Hecate as the archetype. "Whenever you tell the truth to someone else, especially if that truth shakes a premise, this moment becomes a folk in the road. Likewise, whenever you ask for the truth, Hecate is the inner wisdom that prepares you to hear it." These stories in Greek mythology are familiar to many of us. They are juicy and full of the foibles of human existence as acted out by the gods. Greek gods are not role models. They do not serve as exemplars and yet, Hecate, filled with mystery, knowing and intuition calls to all the crones. If you don't know the story, check it out at Oxford's Classic Mythology site. Some future day, I'll tell the story to you myself. Hecate most certainly embraces the wise woman archetype we seek, so a further explanation is warranted. In the meantime, let's start by listening to Bolen discuss the archetypal energies of the goddess. There is so much more to reflect on, after that..
By the way, for a fun way to identify which of these goddess archetypes best represent you, take this "Archetype Goddess Quiz."